KUWAIT CITY, 28 June (UNDP Kuwait) – The United Nations Development Programme in Kuwait (UNDP Kuwait) has registered and launched its Twitter account at @UNDPKuwait. The account is set to make information about the organization’s on-going projects available and create a forum from which the public can have an understanding of UNDP Kuwait’s work, aspirations, initiatives and goals. UNDP is the UN’s global development network, advocating for change and connecting countries to knowledge, experience and resources to help people build a better life. We are on the ground in 166 countries, working with them on their own solutions to global and national development challenges. As they develop local capacity, they draw on the people of UNDP and our wide range of partners. 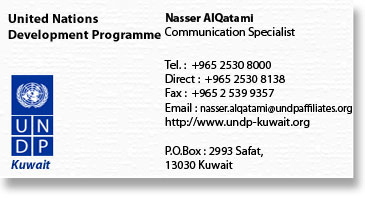 You can get in touch with UNDP-Kuwait online, via their twitter account, or by contacting their communications specialist, Mr. Nasser Al-Qatami. The UNDP is an important, prestigious, and internationally respected organization. I feel so proud that Kuwait has now joined in on the program. All the best to the Kuwaiti team. Thanks to Nasser Al-Qatami for the press release.